In between spending most of the weekend in the hospital with my grandma and eating plain cafeteria salads, I did find some time for a little gardening. 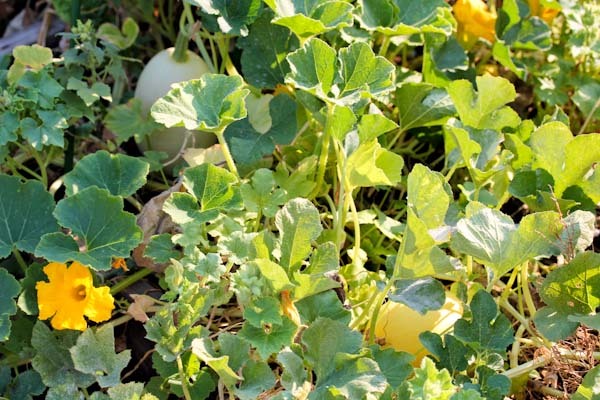 My spaghetti squashes are going crazy which is all right with me, the more the merrier for winter! 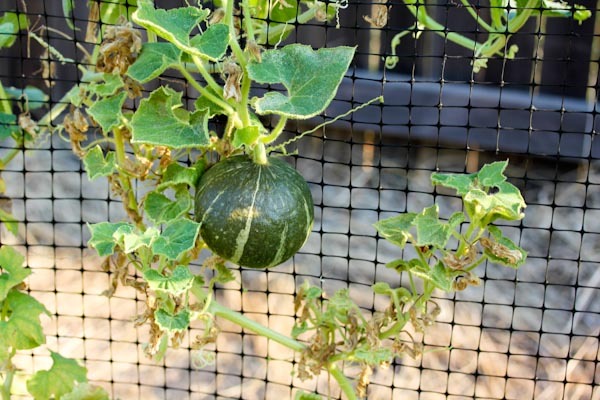 And I’m getting little kabocha squashes! Cant wait to use these for baked kabocha wedges, lentil stews, and kabocha curry sauce! I also had my little, fly-chasing garden buddy. If only I could get her to do that inside with mosquitoes! I also got experimental with more garden-freebie zucchini since I can’t seem to eat these monsters fast enough, I’ve even been putting them in smoothies. 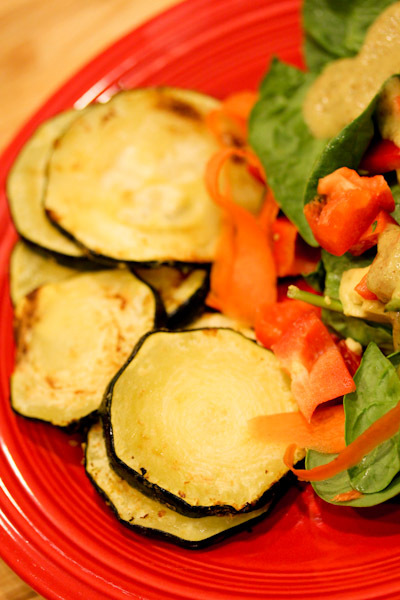 I sliced these chunks into rounds and tossed with olive oil, lemon juice, nutritional yeast, salt, and black pepper. Then baked on a cookie sheet at 350 degrees for 35 minutes. The thinner slices got a little crispy while the thicker ones got crispy edges. 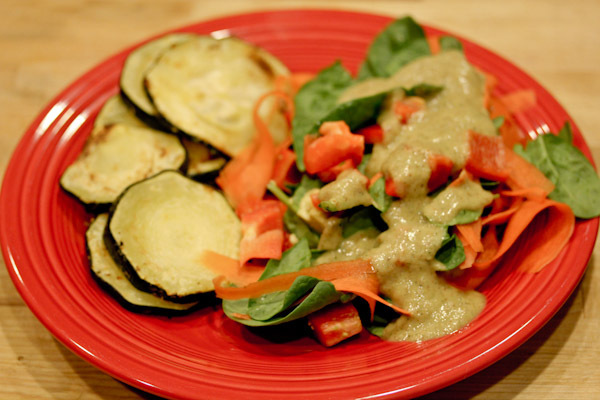 And I whipped up Gena’s Zucchini dressing for a side salad to go with the zucchini rounds. I’m strange like that preferring to overload myself with an ingredient rather than waste it before it goes bad. But my zucchini intensive dinner was actually very good, the rounds and the dressing had unique flavors and textures. The rounds weren’t as crispy as I would have liked, next time I need to bake them on a grid. 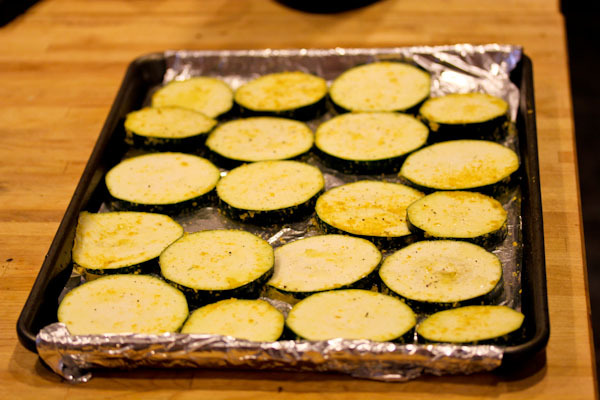 But still a tasty and fun way to enjoy zucchini. And this dinner polished off my zucchini stash, time to start in on the squashes spaghetti squash! I hate to waste food too! So I would have overloaded just like you did. How’s your grandmother doing this week? I’m sorry you had such a stressful weekend but glad you were able to spend time with her. 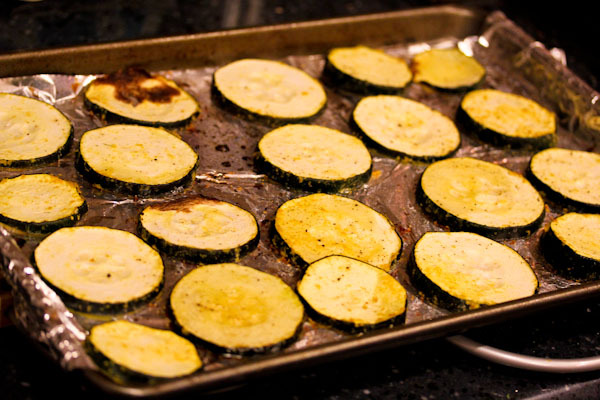 You zucchini dinner looks fantastic! 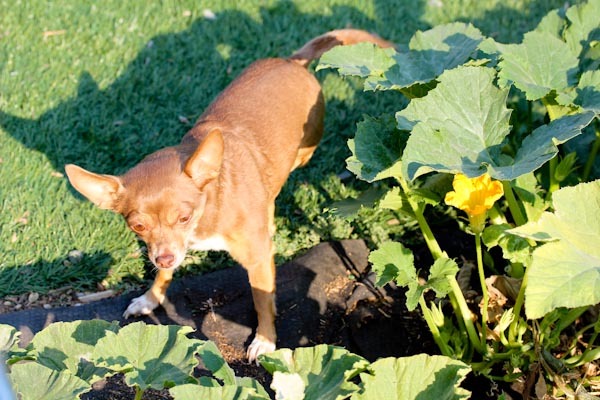 I love your garden shots– you’ve done such a great job with that! I love zucchini! And now I know what the round ‘zucchini’ are called. LOL. My husband and I found them growing wild at one of our nearby trails. Perfect easy dinner! So sorry you have been so busy with grandma. How is she doing? I’m sorry to hear about your grandmother, I hope she is ok. Sending hugs to you! On a happier note, I am in awe and a little envious of your garden (oh and your gorgeous fly chasing chihuahua too). 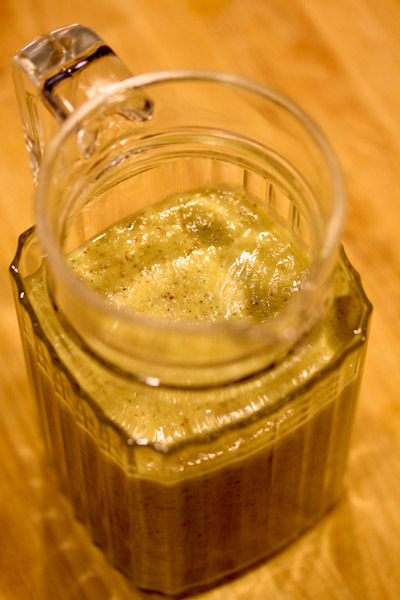 I have been doing loads with zucchini too including in smoothies and I find it actually doesn’t taste too bad. 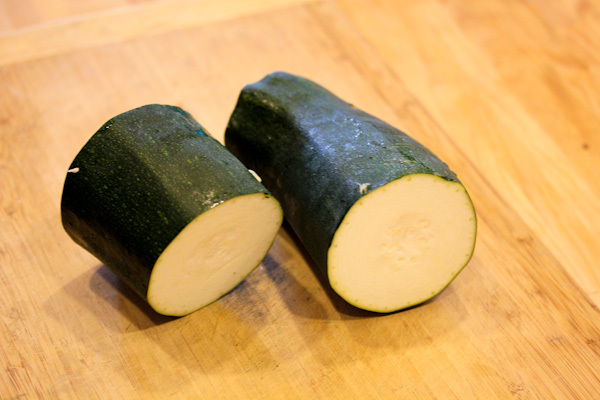 You know you can make raw cakes with zucchini and also this weekend i am going to make some veggie wraps (with zukes) in the dehydrator. I’ve yet to make veggie crisps with them in the dehydrator though, but perhaps you could give that a shot too?